How do the brain and the body respond to food stimuli, which behavioral responses are triggered? How can ICT be deployed to measure and analyze the data? And most important, how can that data analysis be used to influence behavior? Research topics include nudging consumer purchasing behavior (food choice), or consumption and assessment of food and health (e.g. a calorie counter to measure food intake). Consumers are looking for healthier food, ecological products and local produce, but they often lack the required information to make an informed decision. At the same time, the industry seeks ways to increase production, but also to reduce costs and save energy, because the consumer wants a lower price as well. These contradicting interests present a huge challenge to the food sector. ICT is changing the value chain, starting at the farm and through a sequence of processing and handling ending at the consumer. Each partner is challenged to be more efficient, more sustainable and more effective. Information is added along the chain, and producers and customers are increasingly looking beyond one chain-partner back or ahead. Allergy information, fair production and trade, ecological footprints and many other quality characteristics are not only relevant to consumers. In the end, all chain-partners need the information. Smart farming is a breeding place for integrated ICT applications. ICT advances enable the farmer to track the behavior, health and welfare of each individual animal (precision livestock farming). Challenges lie in the field of standardization and interoperability, embedded systems and sensor networks. 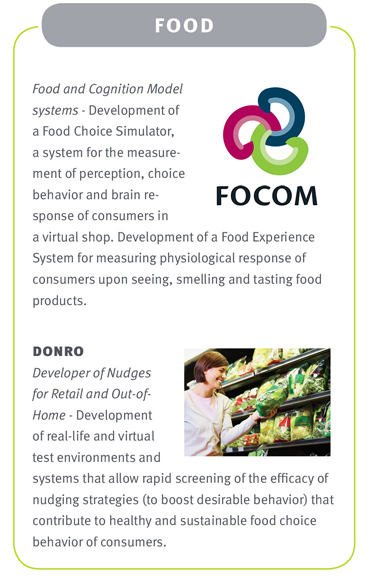 On the consumer side, ICT solutions support increasingly detailed data gathering, for example using video observation and physiological sensing to unravel the relationship between food stimuli and brain responses. Are you searching for an integrated ICT solution to tackle your brain, body or behavior challenge, don’t hesitate to contact us for an information meeting – free of charge, of course!